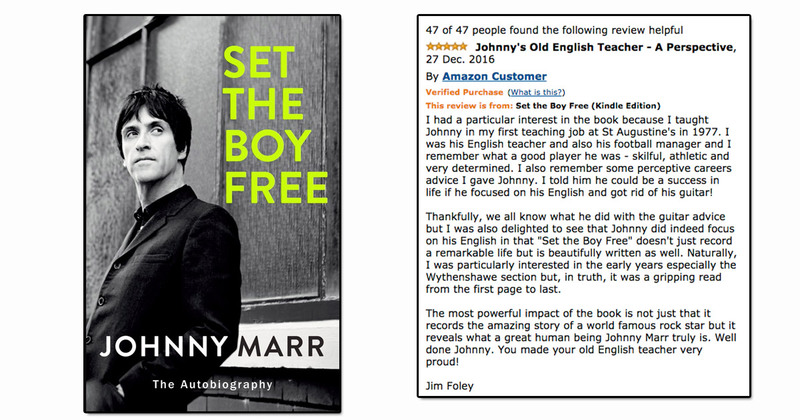 Johnny Marr – ex-guitarist from The Smiths – has written his autobiography and his old English teacher has actually reviewed it in the Amazon comments. Spotted by @Itsandyryan over on Twitter the review is tender and utterly lovely note from someone who is obviously very proud of his old pupil. I had a particular interest in the book because I taught Johnny in my first teaching job at St Augustine’s in 1977. I was his English teacher and also his football manager and I remember what a good player he was – skilful, athletic and very determined. I also remember some perceptive careers advice I gave Johnny. I told him he could be a success in life if he focused on his English and got rid of his guitar! Thankfully, we all know what he did with the guitar advice but I was also delighted to see that Johnny did indeed focus on his English in that “Set the Boy Free” doesn’t just record a remarkable life but is beautifully written as well. Naturally, I was particularly interested in the early years especially the Wythenshawe section but, in truth, it was a gripping read from the first page to last. The most powerful impact of the book is not just that it records the amazing story of a world famous rock star but it reveals what a great human being Johnny Marr truly is. Well done Johnny. You made your old English teacher very proud! Seriously. If any TV producers are reading this – reunite these two people – we’d watch the hell out of this. And also, we realise we need to read Marr’s autobiography now. Well that’s us ruined for working for the day.